Republicans have never been closer to repealing Obamacare than they are right now, but they’ve reached this precipice just as the partisan consensus that Obamacare should be repealed has begun to fray. These two phenomena are related, but distinct, and together they explain why the effort to pass Trumpcare has been so herky-jerky. The hideous unpopularity of the GOP’s proposed alternatives to the Affordable Care Act has helped to drive Obamacare’s popularity upward, which has in turn fed the view that fixing Obamacare makes more sense than repealing it and replacing it. To cut this dynamic short, Republicans have contrived the conceit that the choice facing their party isn’t between fixing Obamacare and replacing it, but between replacing Obamacare and allowing single payer—universal, government-run insurance—to become the nation’s health care model by default. This argument serves three useful purposes for Republicans. 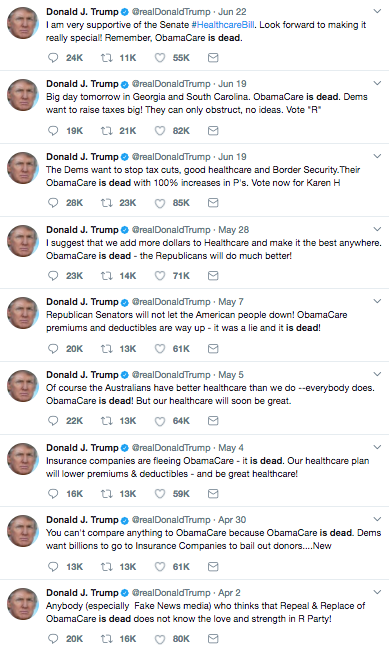 First, it advances the false supposition that Obamacare is collapsing; one of President Donald Trump’s most consistent claims, in public and on social media, is that Obamacare is “dead.” Second, it helps rally wavering Republicans who may not like Trumpcare, but despise federal social insurance. Third, intentionally or otherwise, it has the potential to divide the Trumpcare opposition between those on the left who would welcome the abrupt emergence of single payer and those in the center who want to do whatever’s necessary to save Obamacare. One of the most remarkable things about the fight against Trumpcare, though, is how resistant the left has been to this kind of thinking. It is worth noting at this juncture that the GOP conceit is almost completely backward. In reality, by obliterating the middle ground between the left and right’s health care visions, the enactment of Trumpcare would shorten the way to single payer. Obamacare isn’t dead, but if Republicans kill it, single payer will suddenly become much more urgent and politically viable. After all, if Trumpcare becomes law, Democrats won’t abandon their commitment to universal health care, but they also would be foolish to try to organize the party around passing Obamacare all over again. Thus, in a perverse way, it is in the left’s long-term political interest for a GOP health care bill to become law—and yet, the most committed single-payer advocates in the country have distinguished themselves as the most vital and effective soldiers in fight against Trumpcare. There is a great deal to learn from this interesting and selfless choice, but I want to focus on what it reveals about the much-discussed schism in Democratic politics, and about the differences between how the progressive left and the conservative right think about and approach politics in America. Spending too much time on social media makes it feel like liberal America is stuck in early 2016, forever fighting proxy battles that conspicuously divide factions along the same lines that split the Democratic Party during the presidential primary. The National Nurses United union, one of the most dedicated single-payer advocacy organizations in the country, has likewise reached the conclusion that the human toll of four or eight or more years of Trumpcare would be unacceptable, notwithstanding the possibility that a GOP health care law would make creating government-guaranteed health insurance the incumbent position of everyone left of center. The conservative willingness to use human suffering as leverage to advance policy objectives is almost undetectable in the progressive bloodstream. It is easy enough to divide liberals between those who think Obamacare was an unlovely half-measure that nevertheless improved on the pre-Obamacare status quo and those who think it was a remarkable achievement on its own (though there is considerable overlap between these two factions). It is nearly impossible to find liberals or leftists of any influence who would sit out the fight over Trumpcare, or join the fight to repeal Obamacare, in order to make things worse in the short term (more than 20 million Americans would lose health insurance) for the better in the long run (single payer). In other words, the left isn’t making the perfect the enemy of the good. The same cannot be said of conservatives, who define themselves largely by the things they oppose. It is not a coincidence that Republicans failed to develop and build support for an Obamacare alternative over all the years they railed against it. It is likewise no surprise that conservatives are warming once again to the only idea that has ever appealed to them: repealing Obamacare outright, and delaying their reckoning with how to reform the health care system as long as possible. The right is dividing itself now between a small group of moderates who would welcome detente in the partisan health care wars and a larger group that demands ideological rigidity—even if the consequence of ideologically rigid health policy would pull single payer from the far-off horizon into the middle-distance. When President Barack Obama won reelection in 2012, weeks before the Bush tax cuts were set to expire, Republican leaders mobilized to save as many of those tax cuts as possible. Normally they would’ve just refused to negotiate with Obama, but they knew that maximum obstruction would backfire when the entire raft of tax cuts sunset and Obama introduced a plan to cut taxes for the middle class alone. Their failsafe was a proposal to make the Bush tax cuts permanent, except on income over $1 million a year. Democrats would have resisted such a bill, and Obama may have vetoed it, but Republicans never had a chance to test Democratic limits because conservatives rejected the plan—and any plan that would’ve required them to cast a vote for a tax increase on millionaires—out of hand. By contrast, most Democrats were reluctant to press maximal advantage—by letting middle class taxes increase automatically—because a protracted fight would have harmed millions of workers and threatened a new recession, just as the recovery from the last one had taken hold. Most who disagreed with that strategic decision were nevertheless persuaded not to push the country off a fiscal cliff. In the end, Vice President Joe Biden and Senate GOP leader Mitch McConnell struck a deal to restore taxes on income over $400,000 to their Clinton-era levels. The role the interests of real people play in setting Democrats’ strategic objectives serves as a foundation stone for an unsettled Democratic factional alliance. If the opponents of Trumpcare succeed, they will save Obamacare and, ironically, protract the fight between the wings of the Democratic Party. Once again, the left is prioritizing the public interest over expediting its defining ideological priorities, and once again the right is doing just the opposite.